After reading “The Small House Book,” I wanted to learn more about Tiny Houses and simple living, and the environmental impact of the American lifestyle. I took an online class led by Mariah Coz about Tiny House living called “Tiny Transition and Downsizing.” I made some new friends online who are trying to accomplish the same goals as I am. 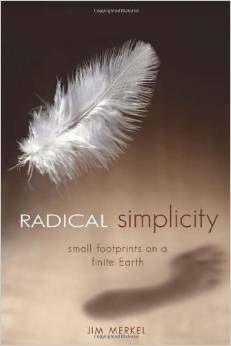 I also learned A LOT from a book Mariah assigned us to read called “Radical Simplicity: Small Footprints on a Finite Earth” by Jim Merkel. Each of us has an “Ecological Footprint” which is a measure how much land and sea space is used to supply what we consume, and absorb the waste we produce. Americans have the highest Ecological Footprints in the world. In America we are trained all our lives to want more of everything: bigger and newer houses, cars, TVs, stereos, etc. Currently the world’s wealthiest 1 billion people consume the equivalent of the Earth’s entire “Sustainable Yield.” Together all 6 billion people are consuming 20 percent over the Earth’s Sustainable Yield. If we continue to live, consume, and waste like there is no tomorrow, there will BE no tomorrow. “Renewable Resources” or the Earth’s Bio-productivity, takes time to regenerate. Resources are only renewable if they are consumed at a slower rate than their annual growth or yield. “Sustainability” means not causing harm to the environment or depleting natural resources, and thereby supporting long-term ecological balance. “Global Living” is an equitable and harmonious lifestyle not only among humans and their future generations, but all the species living on Earth. “Radical Simplicity” means changing the way we do things. Our personal choices do add up. We can help by consuming less, buying locally, living simply, and making wiser choices in all aspects of our lives. It is a life less centered on things, and intentionally shrinking our environmental footprint. NextA Talk by Dee Williams!